Happy Halloween! It's a devil of a shirt this week. 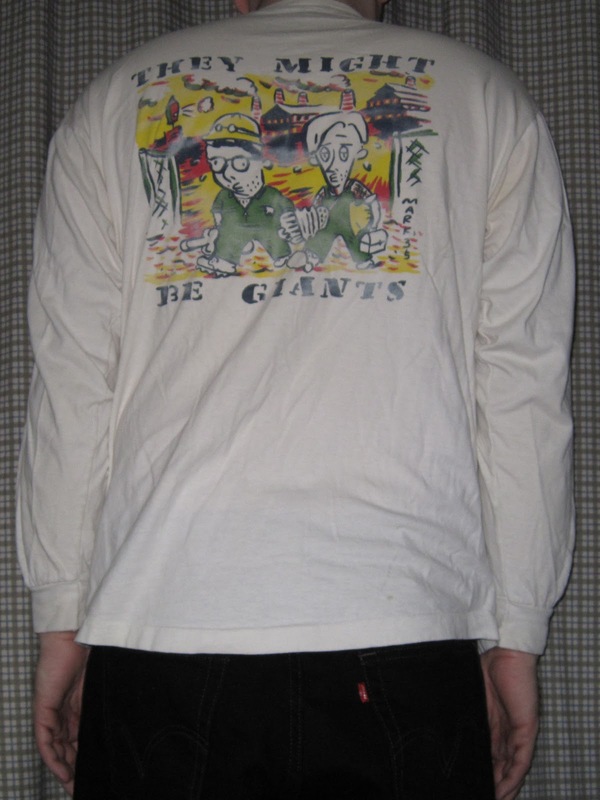 TMBG appeared at the second annual Endfest at the Kitsap County Fairgrounds in Seattle, WA on August 7, 1993. 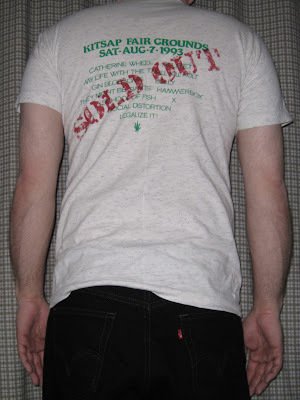 The festival was apparently sold out, with other appearing acts including Gin Blossoms, Belly and Social Distortion. 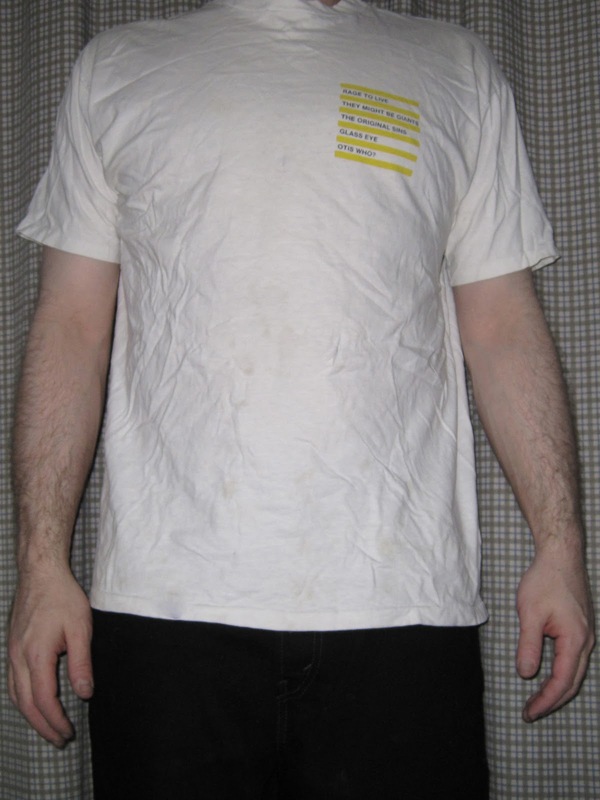 The back of the shirt ends with a "Legalize It!" message and a small marijuana leaf. Here's the video for TMBG's new Halloween song, Marty Beller Mask from the brand new Album Raises New and Troubling Questions. 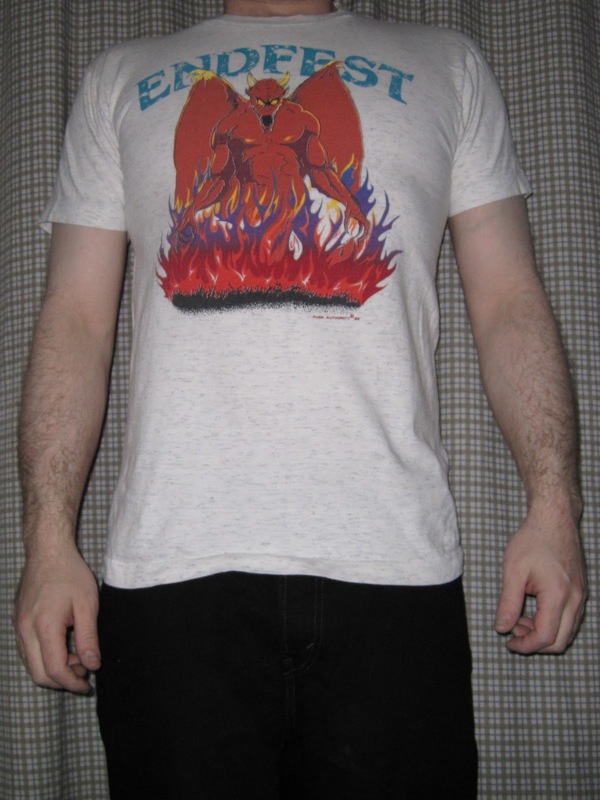 Order now from the merch store. Happy Halloween! 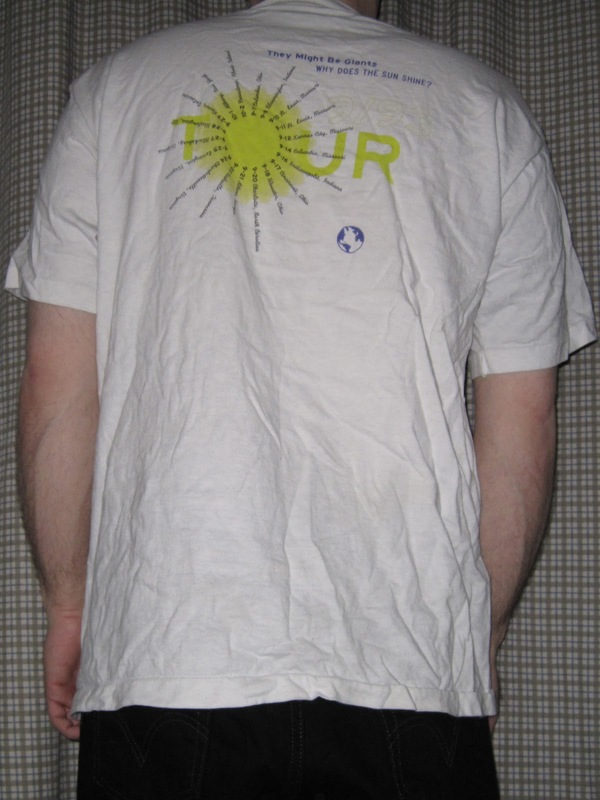 Here's a shirt from the 1993 Why Does the Sun Shine? Tour. A TMBG road sign overlays Sol while containing and surrounded by the musical tools of the trade. The back lists nineteen shows in twenty five days, arranged like the rays of our sun. 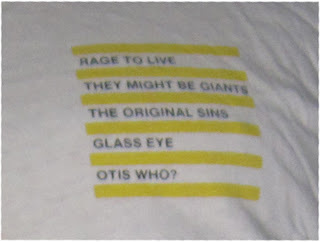 It reads, "They Might Be Giants Why Does the Sun Shine? 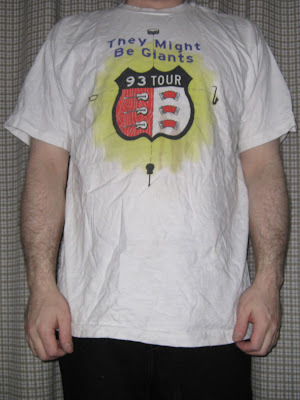 9/93 Tour" even though the last couple of dates took place in October. My first show was in 1993, though in April and thus not part of this tour. The Earth is also present, though not to scale. 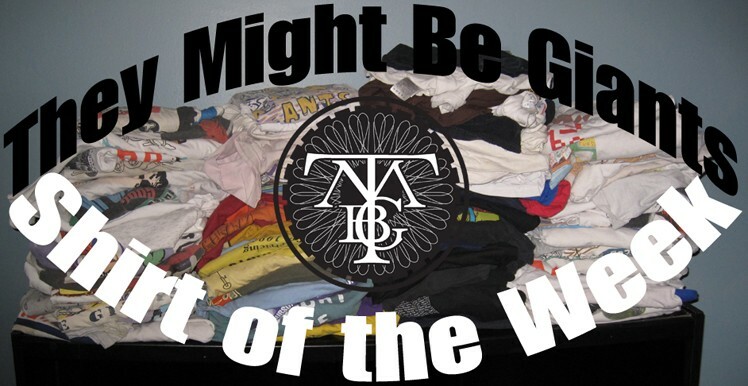 John Flansburgh brings up the subject of TMBG t-shirts. Performed at the Berklee Performance Center in Boston, MA on 10/1/11. 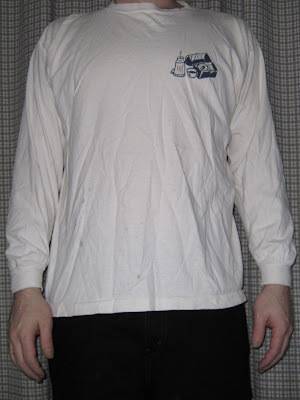 Making a rare long sleeve appearance are the Worker Johns. Another design by Mark Marek, who is of course responsible for the very first shirt in this series, "Hayseed Johns". 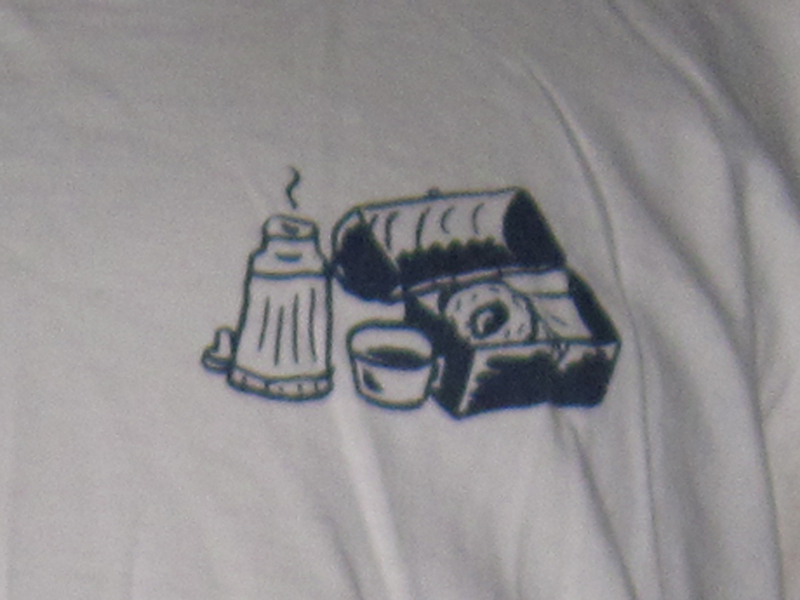 The front of the shirt simply bears the standard lunch break gear of the factory worker: a metal lunchbox containing a sandwich and a doughnut with a steaming thermos of java. On the back are John and John decked out in their worker greens in a brightly colored industrial setting. Flansburgh is sporting some stubble and a construction helmet. Linnell deftly carries his accordion with one arm while holding his own helmet and the aforementioned lunch pail with the other. Both appear winded and sweaty after a hard day's rocking at the record factory, pictured in the background. The life of a rock musician is indeed a hard one! This Venue Song was performed at the Berklee Performance Center in Boston, MA on 10/1/11. As you may know, They Might Be Giants have resurrected Battle For the Planet of the Apes after a eight year hiatus. It has been rebranded "Ape Club" and thrust upon the unsuspecting audience, which as always are divided directly in half and instructed to chant the words "PEOPLE!" and "APE!" with a raised fist as the band plays. John Flansburgh has taken it a step further by using a blinding flashlight (Flanslight?) to create an aisle of emptiness in the middle of the club. Check out the video below to (kind of) see what I mean. A new 2011 tour shirt has been introduced to coincide with the Rise of Ape Club. 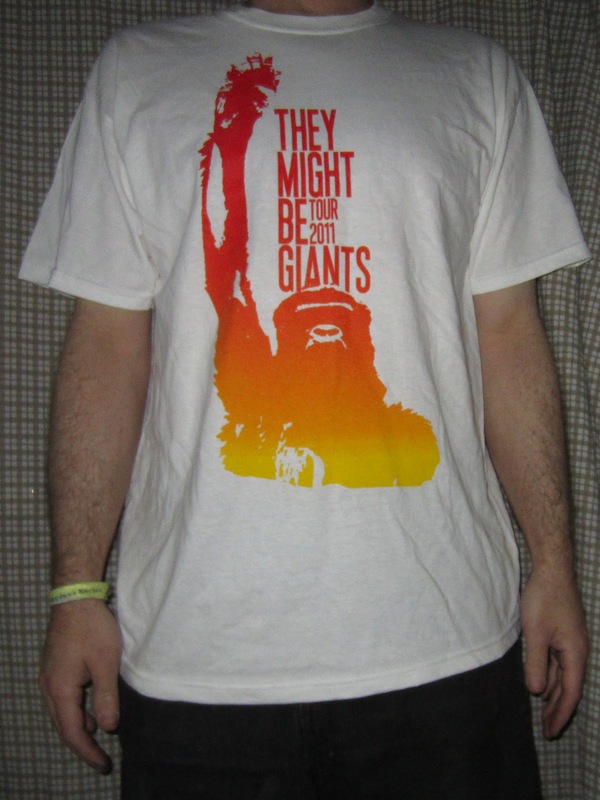 It features a damned dirty yet colorful ape with clenched fist held aloft. "Monkey Tour on White" is available for purchase at the Merch Store, so go get it and Ape out! 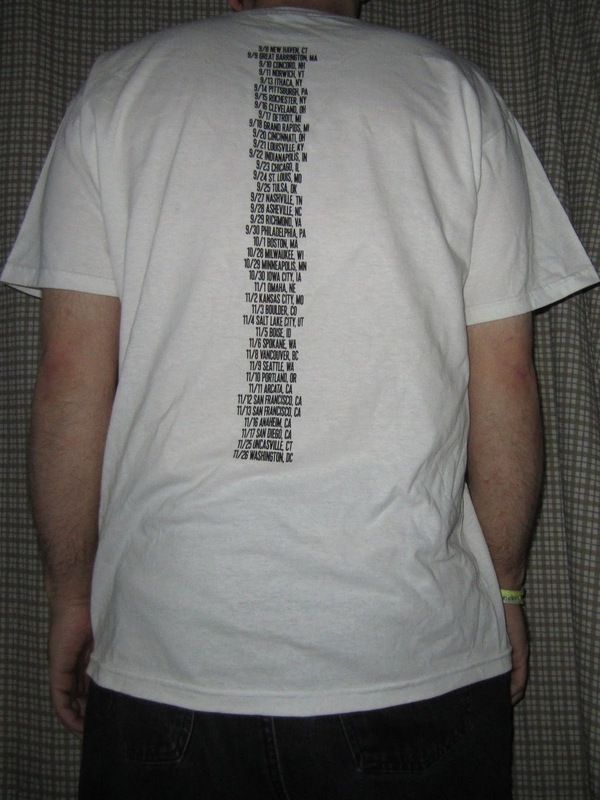 On the back, a listing of the dates that comprise the first two legs, or first half of the tour. It began on September 8 in New Haven, CT and ends on November 26 in Washington, DC. 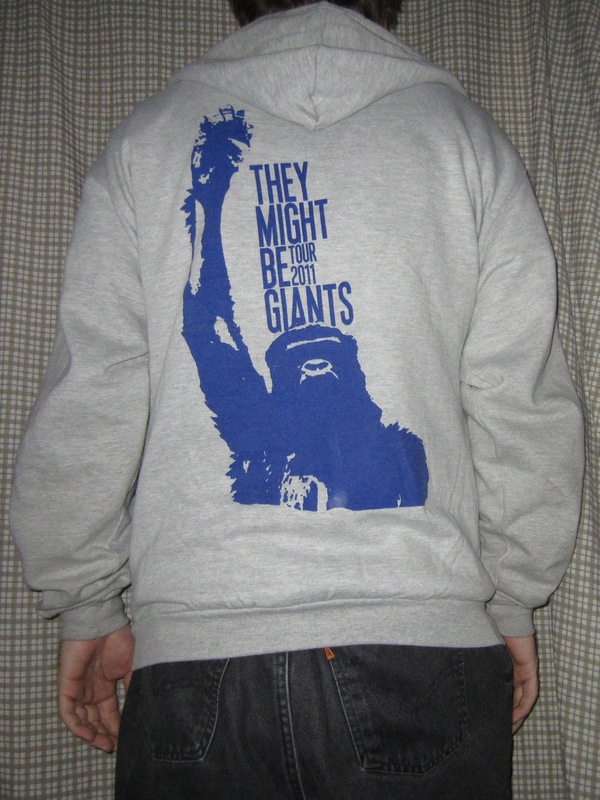 There is also a new Ape hoodie available. 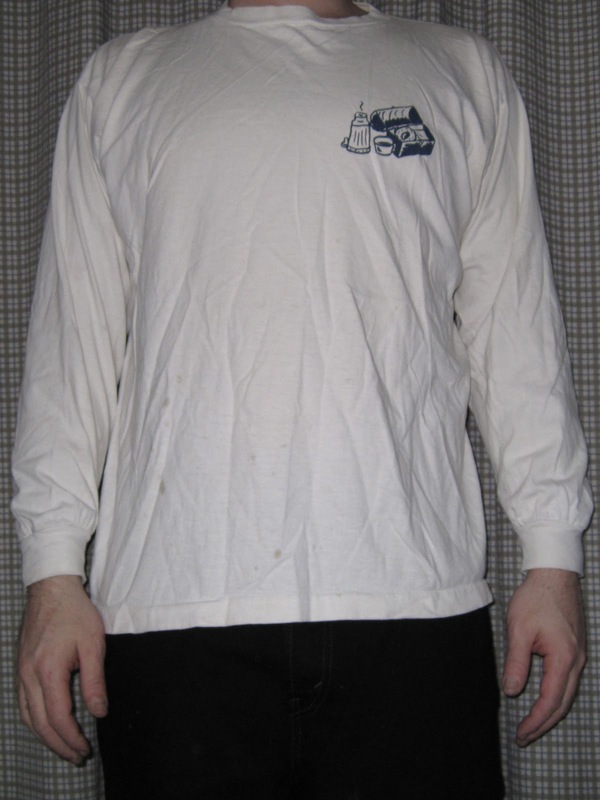 It has the ape on the back and the familiar "Road Crew" inscription and logo on the front in white with blue swirlys. To finish off the Ape theme, here's the performance of Ape Club that I shot on September 30 at The TLA in Philadelphia, PA, which ends with an unprecedented result. Check it totally out! TMBG opened in Boston with this. If you would like to feel as confused and surprised as we did at the show, I suggest that you press the play button without hovering over the above link, which will reveal what song was being played. Performed at the Berklee Performance Center on 10/1/11. Here's a neat shirt from Bar/None, They Might Be Giants' first record label. On the front, TMBG is listed with four other Bar/None bands. 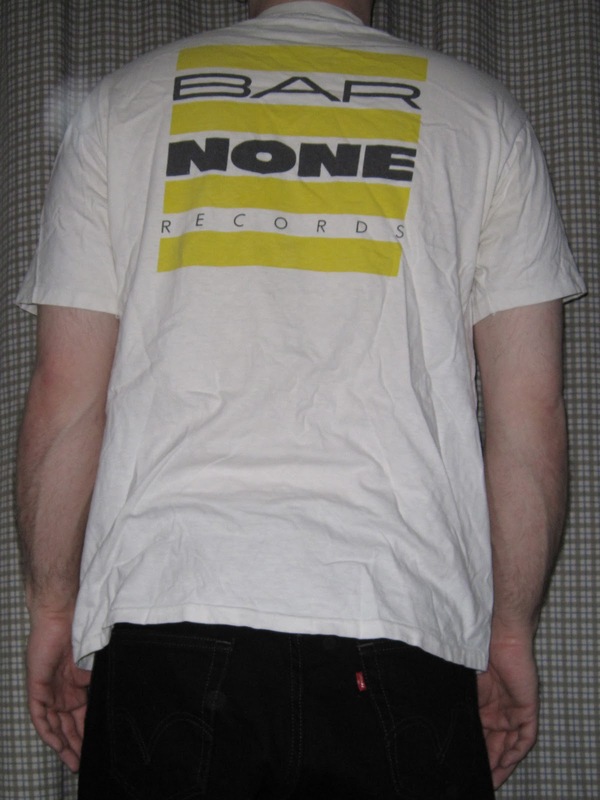 On the back, the Bar/None logo. This popular Bar-None era song was performed at the Capitol Center for the Arts in Concord, NH on 9/10/11.